Webinars have become very popular for marketing, promotions, and launches. It is a great way for solo entrepreneurs, coaches, consultants, service professionals, and small business owners to build their lists, share their messages, and promote their products and services. It also allows us to effectively build a personal connection with our audience to accelerate the “like, know, and trust” factor – as long as we are willing to step up and be truthful, honest and transparent in our communication. 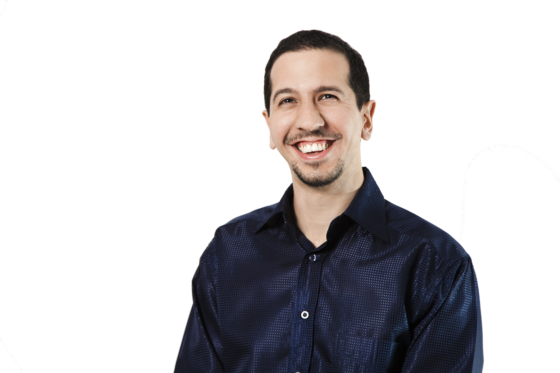 We don’t have to look far for proof—Danny here are Mirasee did a million-dollar launch for the Course Builder Lab using a combination of videos and live webinars. And he routinely holds webinars to promote the Audience Business Master Class to JV partners. If you have been thinking about doing webinars but are stuck in analysis paralysis. If you have not been able to get started with your webinars because you don’t know which platform to use, how to get the technology to work, or feel reluctant to invest in one of those expansive tools before you are certain that a webinar is indeed a good fit for your style and your business. I get it. I was there just a couple of months ago when I decided I didn’t want to wait any longer. So I gave Google Hangout a try, seeing that many of the new webinar tools are integrating with Google Hangout for broadcasting and recording. Not only is Google Hangout free, but it also allows you to have unlimited attendees, and it records and post to YouTube automatically—using the same link for live broadcast and the recording—saving you not only trouble, but also storage space! After a lot of trial and error and some pigheaded determination to make it work, I managed to put together an entire webinar sequence using existing no- or low-cost tools and Google Hangout—from sign up all the way to replay—and pulled off my first webinar with success. I want to share with you the entire process in this post, so you too can share your message and promote your offers through a webinar without the technology confusion, or having to invest a good chunk of change upfront before knowing if webinar is beneficial to your business. The process I am sharing here is a bit of a duct tape approach. Even though the end result can look pretty good, it is not completely seamless or fully automated. Even though you do have to put in some elbow grease to tie all the pieces together, the key is that you have the how-to, and you don’t have to worry about the cost. This enables you to put this webinar together and get your message out there in front of your ideal clients. Then if you find webinars fit your style, your message and how your ideal clients like to consume your content, and you are ready to take it to the next level, there are many tools and platforms you can purchase – at that time, you can feel good that your investment won’t go to waste. Maybe, you even make it back with your first $0 webinar! These instructions are based on using a self-hosted WordPress website (i.e. set up via wordpress.org, not wordpress.com) which is the most popular platform nowadays. If you are using a different platform, you may be able to devise some workarounds based on the principles, or find the tools to perform the same function. First we will design the user experience you want to deliver to your audience. 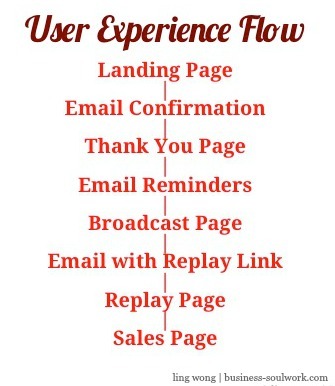 Mapping out the user flow can give you a bird’s eye view and help you make sure you have all the pages accounted for. First, from whatever sources you are driving traffic—be it social media, email, or even a flyer—the potential participant will come upon a landing page where they get to see what the webinar is about, and to sign up. Next, they will receive an email from your email service asking them to confirm their subscription. After they have confirmed, they will be redirected to the thank you page on your website. A day or two, a few hours before, and at the start time, those who have registered will receive email reminders with a link to your event broadcast page join the webinar. At the time of the webinar, attendees will go to the broadcast page on your website, either as a blog post or a page depending on the kind of commenting mechanism you choose. After the event is over, the broadcast page can be redirected to the replay page. Those who sign up for the webinar will also get a link to see the replay via email if you choose to offer a replay. On the replay page, you will include a call-to-action, either a link to a sales page or to book an initial consultation with you. If you offer a limited time replay, you can choose to set it up such that the URL gets redirected after the “expiration date,” something that a few page builders allow you to do. Or you can do it manually with a 301- redirect plug-in. Either way, if you say it is “limited time,” keep your word or else no one will take your deadlines seriously anymore! Landing page for sign up, sign up thank you page, event broadcast page, replay page, and sales page if applicable. I have been using InstaBuilder 2.0 to create my landing pages. You can choose any page builder that works for you. You don’t necessarily need to purchase a page builder plug-in. You can simply use the landing page template on your WordPress theme to create your sign up page. However, in my opinion, it’s a small price to pay so you don’t have to wrangle with WordPress to layout your page, or figure out “fancy” moves such as how to code a two-step opt-in. You can use a countdown timer to add a sense of urgency. Research has shown that a two-step opt-in has a higher conversion rate, and most page builder tools provide that functionality. Always test to see what works for your audience, and many page-building tools offer a split test functionality. You can absolutely use the thank you page provided as part of your email list sign up sequence. But I like to spend a few extra minutes to set up a page on my own site with a “next step” so people will be redirected back to my website after the sign up process. Asking participants to add the event to their calendar. Asking participants to share the sign up page link with their friends. If you have a “viral gate” plug-in, you can ask participants to share the sign up page link on social media to unlock a piece of free content. A blurb on what participants can do or expect next, e.g. they will receive a series of welcome emails, or they can go check out a related article on your blog etc. After this page is created, pop its URL into the thank you page redirect in your email service form set up. When the user completes the sign up process, she will be redirected to the thank you page on your website. Last but not least, after you have set up this sign up sequence, test to make sure all the touch points are coherent and the user flow is what you have in mind! 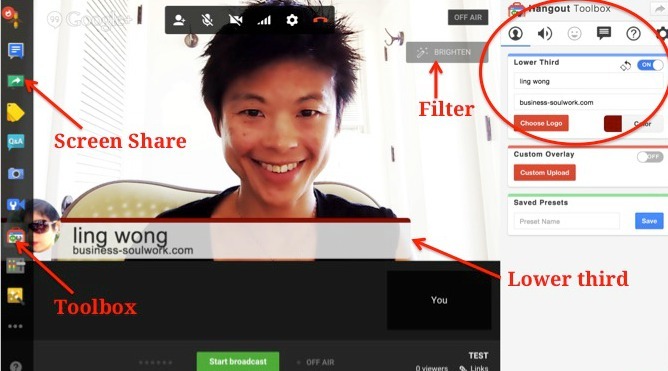 You have to use Hangout On Air to have your webinar recorded. It doesn’t have to be broadcasted publicly if you set it up as a “private” event. You need to set up a Google Account to start. You are all set if you are using Gmail. 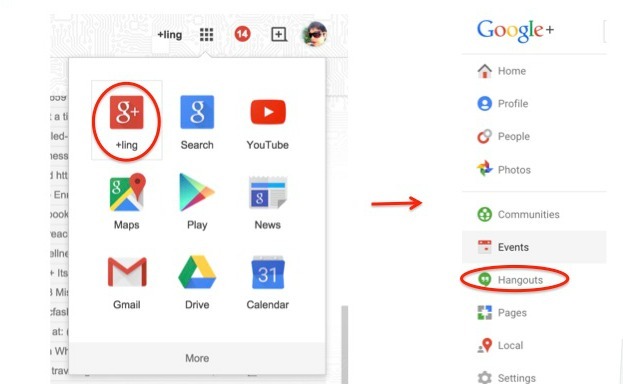 If you have a Google Account already, go to your Google+ page. If you are accessing it from your Gmail account, it’s under the tile-like icon on the top right corner. When you get to your Google Plus page, click on the down arrow right next to “home” under the Google Plus logo on the top left corner. Select Hangout in the dropdown menu. You will be taken to the Hangout On Air page. Scroll down a little, and you will find the blue button that says “Start a Hangout On Air.” Click on it. A pop-up window will appear to schedule your hangout. Here you can choose who gets invited to participate. If you are doing a test, definitely don’t share it with “Public”! Click on the x next to “Public” in the audience field to delete it, and input your own email address. You do need an email address in that field, and last time I checked, you can’t use the same gmail address as the one you use to set up the Hangout. When you are scheduling your event and if you want it to be viewable by the public on Google+ and YouTube live, keep “Public” in the audience field. If you want it to be only accessible via your broadcast page and replay page, you would take “public” out and just invite yourself. Next you will be redirected to the page for your Hangout. Grab the Video Embed Code, which you will paste into your broadcast and replay pages. To keep it simple, I am setting it up as a regular blog post to use the comment function already built into your site for questions and comments. You can also set it up as a landing page, but you will need a plug-in that allows you to add commenting function to individual pages using shortcode if you want your webinar to be interactive and allow participants to comment and ask questions. I recommend choosing full-width layout, so you don’t have the sidebar elements on the page that may distract the viewers’ attention. To embed the video code, go to the text tab and paste the embed code you grabbed from the Hangout event page and paste it into the code. The default size for the frame is 560×315 px. I like to make it bigger to take up the width of the page – it is also more legible if you are showing slides. You can replace the width and height in the code with any size you want as long as you keep the proportion consistent with the default size – I usually make it 700×394 px. Next is to set up your replay page. You can use a low-cost page builder (e.g. InstaBuilder 2.0) or the landing page template in your WordPress theme to create a landing page without any other distraction. It also allows you to include a countdown if you are offering a limited time replay, and the option to set up a redirect (e.g., to your sales page) when the replay expires. This page should be pretty simple—a header, a countdown timer for limited time replay, and a call-to-action (e.g. link to your sales page) would suffice in most cases. In fact, you don’t want to include any non-essential elements that may distract the viewer from following through your call-to-action. To link up your video, most page builders give you the option to embed the code you grab from your Google Hangout event, or the YouTube URL. The same code is used for both the live event and the recording. Before your webinar event, set up a private test event, embed the code to your broadcast and replay pages, run the event to make sure you are comfortable with the technology and everything is working smoothly. To start your broadcast, go back to your G+ event page and hit start. A new window will open. You can click on Hangout Toolbox and create a lower third with your name, title, and/or website URL—anything you want to have as a consistent element in your video. You can use the screen share icon to share a screen from your desktop, e.g., if you want to share slides. I recommend creating a PDF from your PowerPoint instead of showing the slides from PowerPoint, the reason being that if you go to full screen mode on PowerPoint, you can’t see the rest of the your screen to monitor the activities on the page. If you don’t go full screen mode on PowerPoint, the slides can look small and less legible. You can of course do full-screen mode if you have two screens so you can monitor activities on one and run the slides on the other. You can also play around with filters, It is particularly handy when the lighting condition is not optimal. The filter can help you brighten up the image. The enhance mode is also pretty handy for smoothing out blemishes. To start a broadcast, hit the green button and make sure it says “on air” before you start talking! There is about a minute or so delay so don’t freak out when you have started the broadcast but the screen on your broadcast page is still dark. You may want to have the broadcast page open during your webinar to make sure everything is looking fine from the viewer’s perspective. To avoid echo, mute the broadcast using the control on the video (not from your computer because it may mute the mic as well). If you have any caching plug-in installed on your WordPress site, such as WP Super Cache, you need to disable it before your event to make sure the page refreshes in real time for the broadcast to run smoothly. You can re-enable it afterwards and it will not affect the quality of the replay. After the event, if you offer a replay, you can set up a redirect using a plug-in, such as Redirection, so people who click through to the broadcast page will be redirected to the replay page. The replay page offers less distraction and the only CTA on that page is to take the next step you want the viewers to take. If you offer a replay, also go back to the sign up page and email sign up form to change the verbiage. You can keep promoting the replay and continue building your list until the replay expires. After the event is over, you can go to your YouTube video to determine if you want to keep it public or unlisted. If you want to make it accessible to public, optimize the title and the tags, as well as update the description to include a CTA. For example, include a link to your sales page. If you want to allow only those who have signed up to have access to the recording, you can keep the full webinar as “unlisted” and use the trim function on YouTube to create a snippet of the webinar to make public. Then you can add a CTA on the screen using the annotation tool and also in the description to direct viewers to your sign up page to get access to the full webinar. To make your video work hard for you on Facebook, download the MP4 file of this snippet to your desktop. Then, upload it to Facebook and put a CTA in the description to direct viewers to your sign up page if they want to watch the entire webinar. Why not just cut and paste the YouTube link? At the time of writing this post, videos uploaded directly to FB receive way more views. Once I boosted a post with a video uploaded to FB directly, and it came out to costing me just one cent per view. I have put together a video training series to illustrate the entire process – step-by-step with annotated slides and task checklist you can download and follow along. Plus, I talk about the 4 reasons why you may still feel stuck, or don’t know where to begin (e.g. what to talk about? Where to find my audience?) even though technology and cost (the reasons you thought were holding you back) are no longer an issue. You can get access here. If you go in thinking you can’t handle it, you will look at the bumps and hiccups as evidence that you can’t handle it. Click To TweetReally, it’s that simple. It may sound like some trite personal development stuff… but it’s true so let’s roll with it for a moment. You don’t have to be “tech-ie” to make things work on WordPress, or to hook up your online marketing. I had a client who asked a friend who teaches computer stuff in the university to help her with website, email marketing, social media and whatnot… of course, that friend has NO idea what Mailchimp is about, or how to make Facebook work for a business. If you are thinking “tech-ie-ness” is what you need, you are barking up the wrong tree. The key is to have clarity about your vision and business goals, then translate them into smart strategies and optimal user experience. Outsourcing costs you a little; misalignment of your communication can cost you dearly. Many competent coders don’t get it right the first time (I have witnessed this time and again during my 10 years working closely with these guys in digital marketing agencies.) It is about having the confidence to keep a clear head and ask the right questions – trust that you can do it, and think creatively. Don’t hide behind the “I am not tech-ie” defeating self-talk as an excuse. If you don’t preconceive what you can or cannot do, you may be pleasantly surprised by what’s possible. Your potentiality is only limited by the fence constructed with what you tell yourself.Click To Tweet Mind your words. It’s your turn! Leave a comment and share your big plan for your webinar. I didn’t know google hang outs had unlimited participants. I can’t wait to digest this. But first, the beach. Unlimited people can watch, but there is a limit to the number of people who can join the broadcast… but I think the number is enough for most purposes. Thanks, and glad it helpful 🙂 Enjoy the beach! Thanks for “hanging-out” with us and doing this post for us. You have done a great job in giving specific directions for the entire Google Hangout Webinar process. Plus, you provided some excellent inspirational content to help encourage each of us to take “imperfect action” as suggested in a post a couple of days ago. Do you by chance use a software program called WebinarJam that supposedly improves the Hangout webinar process? Thanks for the tip on Easy Webinar, Ling. Thanks Ling…..I have been putting off going down the webinar path due to lack of techie knowledge and fear, I guess. Your blog has demystified a lot of my concerns and given me some great steps to start with. I look forward to putting all this into action. Glad you find it helpful, Maureen! I think the concrete information will be very helpful to help you get over the mindset/fear part. Thank you, Ling! I have been holding out hope that I can outsource, but this does not sound too promising, now. Thankfully, there were only a few things you mentioned that were completely foreign to me. Perhaps, in time, I can get past my most immediate roadblocks and get to some of those issues. I just have to remember that even though I feel as if I am treading water, in an ultra techie world, I have come a long way, since the room sized computers I remember so well! Glad it’s helpful, Peggy. I would say start with something simple, get small wins and build on it. You don’t have to do the whole thing all at once! This is great information Ling. As a professional “techie” myself I should be complaining that you are taking the food out of my family’s mouth! 🙂 However, I can confirm that the reason this is not a problem is because we spend our lives trying to make this stuff easy for people to work with and nothing gives us greater pleasure than to see entrepreneurs jumping in and making it work for their businesses. I think a lot of people get intimidated by the headlines and don’t realise that, as you have shown, this stuff is designed to be easy to set up and use. WordPress.org is a perfect example of how a “techie” community has come together to provide a free resource which anyone can learn to use very quickly and take advantage of free support in the forums. Hundreds of developers work voluntarily to create themes and plugins to cover a huge range of functions which would normally represent days of coding if outsourced for each new site. Most of the time, as you say, if you concentrate on the business goals and user experience path there are ready-made plugins and free or very low cost webservices available to help you make it happen. Thank you Ling! This post is very helpful for small entrepreneurs to build an effective webinar free. Step by step guide can encourage us to to start this process. Google Hangouts aren’t just for beginners – I know a very successful marketer who uses them because of the exposure on Google. Especially good tip about uploading videos to FB to get a better deal on clicks. Thanks Cathy! The SEO power of Google and YouTube is definitely a big plus. Ling, take off the glasses. I think it’ll give you a 500% increase in opt-ins, comments, clients. Don’t hide. I am glad it’s helpful, thanks Pat. Thanks Yuna – definitely something to check out! Thanks Ling – terrific tips!